Just added a lot of magazine and newspaper Rebel Heart Tour reviews scans to our Rebel Heart Tour page. There are articles from the shows in Amsterdam, London, Paris, Antwerp and Glasgow, find them in the ‘press’ section. We have also added some used tickets in the ‘memorabilia’ section. Enjoy. 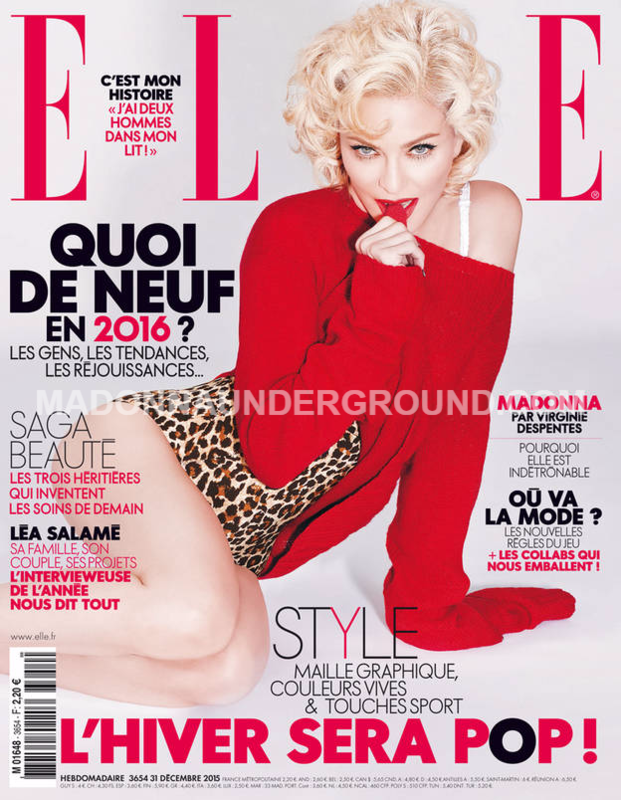 Madonna is on the cover of the French ELLE magazine January 2016 issue, this will hit newsstands tomorrow (December 31). Backstage in the bowels of Antwerp’s Sportspaleis, Jason Danter cheerfully apologises in advance for all the swearing. He’s Rebel Heart’s production manager, which, he says, basically translates as, “How the f— do we get this into this?”And that takes some doing. So far, Madonna’s 81-date Rebel Heart tour has rumbled 27 semitrailers of equipment and 185 staff across North America and Europe; but that’s a lot easier than coming to Australia and New Zealand in March, for which three Boeing 747s are needed. Madonna hasn’t visited our shores since 1993’s Girlie Show tour, so unsurprisingly the $1999.90 front-row seats in Sydney, Melbourne and Brisbane were exhausted during presales. Danter served in the Royal Navy, which comes in handy now. “The military teaches you discipline,” he says in his Brummie accent. “You need to make decisions, have plans, work whatever hours are needed to get the job done.” He and his crew have been on site in Antwerp since 7am, joined at around 10am by tour director Tres Thomas. At university, Thomas was more interested in selling tickets for student shows than singing and dancing in them. His qualifications in accounting and law perfectly suit him for the business of touring, which he’s done for 35 years. He works for Live Nation, which in 2007 signed Madonna to a 10-year global partnership, the first of its kind.